My turkey is in the oven, the rolls are rising, the pies are baked, the potatoes are ready to mash and my husband is still in bed. Typical Thanksgiving around here and I'm sure in many other homes around the country. I didn't get a chance to make many fall or Thanksgiving cards this year. I was busy making thank you cards for my brother-in-law's wedding that is this Saturday. Their colors were black, ivory and burgundy but they are using red roses. I created a pocket card in black with an ivory insert. I punched out a peek-a-boo window with a 1 1/2" punch. I would have loved to make the window a little bigger by using my spellbinders but I had 50 thank yous to make and my arm could not have taken all that cranking! 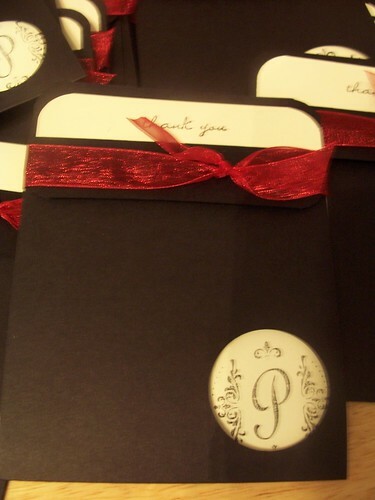 I stamped thank you at the top and used the Damasks with the elegant font on the 1 5/8" Just Rite Stamper. 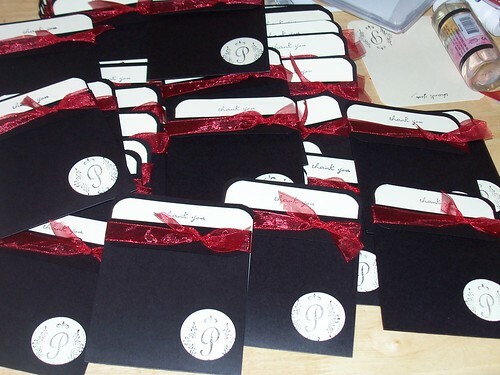 I finished the cards with a simple sheer red ribbon knotted at the side. I hope you and yours have a wonderful Thanksgiving. I am off to finish up Thanksgiving and start on the fajita dinner for 20 that is tomorrow night. Don't forget all the great shopping to be done as well.